Pakistan Prime Minister Imran Khan in a recent interview said that peace talks with India could revive if BJP is re-elected. New Delhi: In a recent interview, Pakistan Prime Minister Imran Khan exclaimed that there may be a better chance of peace talks with India if the Bhartiya Janata Party wins the upcoming General elections. “Perhaps if the BJP wins, some kind of settlement in Kashmir could be reached,” Khan was quoted in a report by Reuters. He said that if the next government formed in India is led by the Congress, then it might be too scared to settle matters with Pakistan over Kashmir. As reported by Reuters, Pakistan Prime Minister added, “I never thought I would see what is happening in India right now… Muslim-ness is being attacked.” Khan explained how Indian Muslims, who, many years ago were happy are now worried about their safety in face of alleged extremist Hindu nationalism. He said Modi, like Israeli Prime Minister Benjamin Netanyahu, is electioneering based on “fear and nationalist feeling”. The BJP’s pledge this week to propose stripping decades-old special rights from the people of J&K, which prevent outsiders from buying property in the state, was a major concern, though it could also be electioneering, Khan was quoted. Throwing weight behind peace talks with New Delhi, Khan reiterated that Islamabad is determined to dismantle all Pakistan-based militants in the country and that his government has the full support of its army. The Reuters report quoted the Pakistan Prime Minister saying, “Kashmir is a political struggle and there was no military solution”, adding that Kashmiris suffered if armed militants from Pakistan came across the border, leading to Indian army crackdowns. He further maintained that it was vital for Pakistan to have good relations with its neighbours, Afghanistan, India and Iran if it aims at saving the nosediving economy. 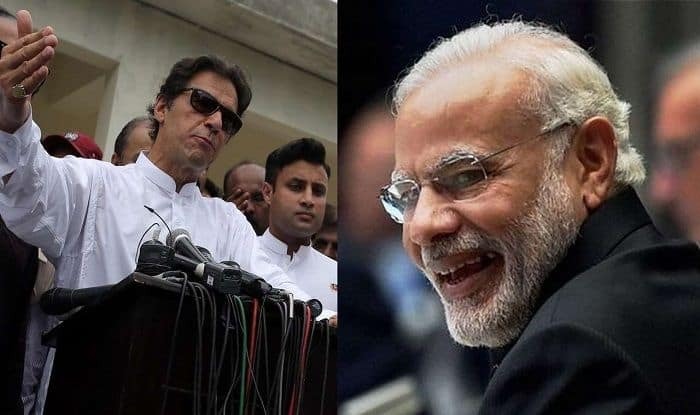 Meanwhile, in accordance to reports earlier this week that Pakistan released- over a looming threat of another attack from India, Imran Khan said that there still was a possibility of one if poll results turn against Narendra Modi. India-Pakistan ties are tumbling under the weight of the Pulwama terror attack in south Kashmir that killed 40 CRPF personnel and ‘pre-emptive air strikes’ by the Indian Air Force in response to it across terror buds in Pakistan. The IAF struck terror group Jaish-e-Mohammed (JeM) camps in Balakot and two other in the Pakistan-occupied Kashmir (PoK) on February 26.